One day at Butterflies & Blooms, I noticed a crepuscular, cosmopolitan imago puddling in order to prepare for an upcoming lek. What did I just say? The vocabulary surrounding Lepidoptera can be very specific—and not so easy to understand. Let’s break it down, and go over some of my favorite butterfly and moth terminology (and learn some of the amazing things these insects do). Then, see if you can decode the sentence above. Cosmopolitan—In this case, a cosmopolitan is not a mixed drink or a well-traveled individual—although this term is related to being in many geographic locations. 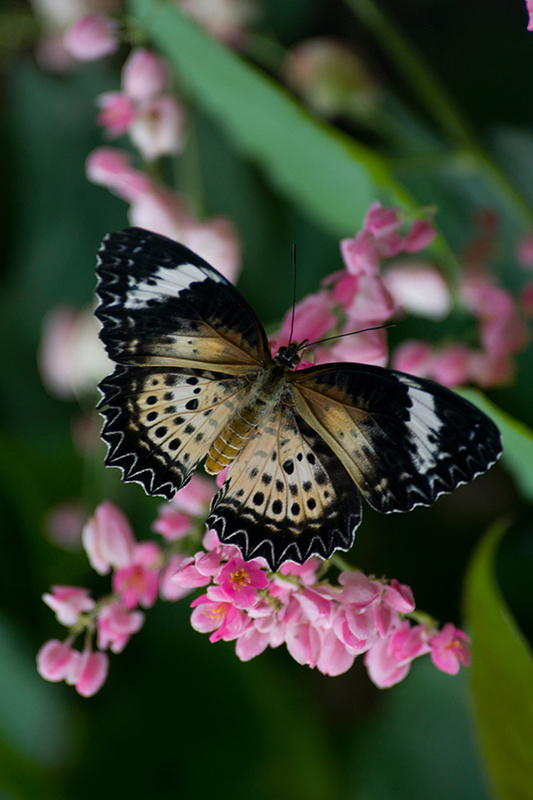 “Cosmopolitan” describes a butterfly species that is found worldwide. 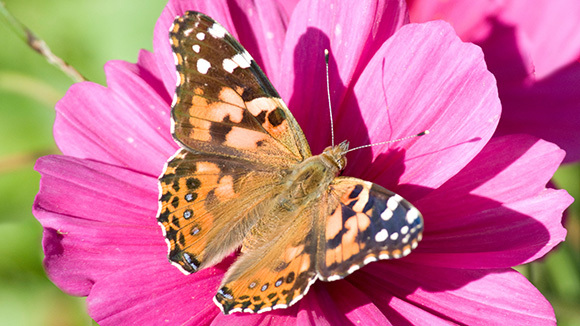 The painted lady is considered cosmopolitan; it is found on every continent except Australia and Antarctica. Crepuscular—Crepuscular species tend to be most active at dawn and dusk. At Butterflies & Blooms, we have a few species that prefer to fly around during the early morning and late afternoon, when the sunlight is less intense. Species such as the giant owl, as well as other butterflies in the genus Caligo are considered crepuscular based on this behavior pattern. Diapause—Here in the Midwest, many people wonder how butterflies survive the winter. The answer is diapause. Chrysalids can feel and respond to the temperature outside of their protective exoskeletons. If they notice a few cold nights, they will react by going into a dormant phase called diapause. When this happens, they cease development, and the shell of the chrysalis will turn brown and harden; this is how they survive the overwintering. Many pupae are green in order to blend in with the surrounding foliage, so it makes sense that they would turn brown in the winter to blend in with the dead, brown foliage. When the warmth and light of spring return, they become green again and complete their metamorphosis into adult butterflies. One of these Danaus chrysippus chrysalids is not like the others. Did it begin to enter diapause during shipment? Or did this African queen butterfly begin its pupation in an area without typical greenery? We are still learning ourselves. Eclosion—Here at Butterflies & Blooms, we normally refer to our butterflies as “emerging” or even “hatching” from their pupal state. 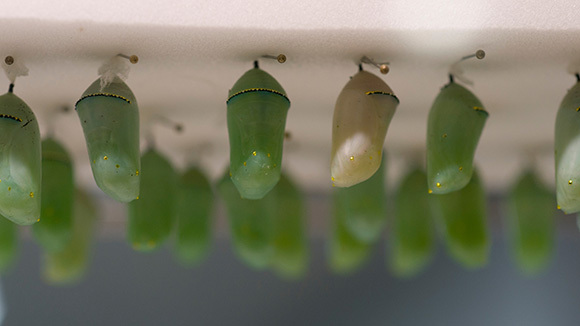 The correct scientific term for this is actually “eclosion.” If you want to impress (or possibly annoy) your friends, tell them that when chrysalids complete their diapause, they resume metamorphosis, and eclose into adult imagos! Frugiverous—Butterflies such as the ever popular blue morpho, giant owl, and the great orange deadleaf are frugiverous; they come from habitats where there aren’t many wildflowers available, so they turn to feeding solely on fruit instead. This is why we have trays of fermented fruit in the exhibit. 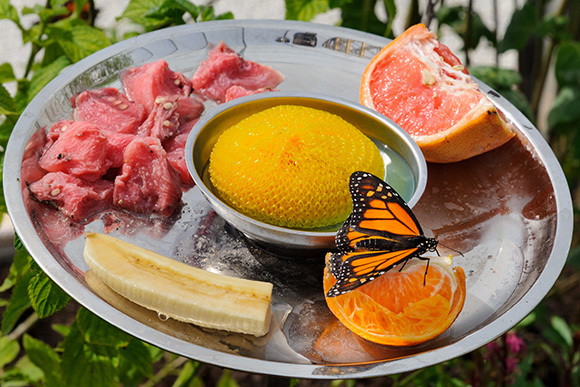 A selection of watermelon, banana, grapefruit, and orange slices are an attractive source of food to frugiverous butterflies like this monarch. Generalist vs. Specialist—Some butterflies are successful because they “specialize” in certain plant families. This means that their success is somewhat tied to the success or failure of the particular plant they evolved to rely on. This is the case for monarch butterflies. Monarchs have evolved to rely on plants in the milkweed (Asclepias) family as both a nectar source and host plant on which to lay eggs. Although there are many different types of milkweed, this is still considered a niche. On one hand, this can be a benefit, because the monarch can capitalize on the unique benefits that come from plants in the milkweed family. On the other hand, if milkweed declines, monarchs don’t have any alternative plant families to use as hosts. Generalists, such as the painted lady, can use a wide variety of plants families to lay eggs on, such as carrots, mints, and nettles. This ensures that they will always be able to find suitable host plants. Humans are also generalists, as we are able to use a wide variety of food sources and habitats. Imago—While we simply refer to our butterflies as “adults,” the true term for the final stage of butterfly development is “imago.” The life stages of a butterfly are egg, caterpillar (larvae), chrysalis (pupae), and adult (imago). Interestingly, the term “imago” also refers to a human individual’s idealized image of himself or herself. What’s your personal imago? Lekking—This is a very interesting term, because until the blue morpho was discovered, lekking was not thought to be a behavior found in butterflies. Lekking is a type of mating ritual in which all the males form a group and compete, showing off their most admirable features. The males with the right stuff will be the ones who get to mate and pass on their genes. With blue morphos, only the most colorful males will get this privilege. I once witnessed a group of blue morphos “lekking” at Butterflies & Blooms. A group of about ten males were hypnotically circling around a single female. I couldn’t believe my eyes! Polymorphism—Some of our butterfly species display polymorphism, including the mocker swallowtail and the postman. This means that within the species, the wings can have numerous pattern variations. This can make their identification tricky. The postman butterfly (Heliconius melpomene) is intensely studied by Lepidopterists because its patterning is more variable than any other butterfly species on earth. Here at Butterflies & Blooms, we have observed at least four distinct patterns from this one species of butterfly. Some have a white “skirt” along the bottom of their hind wings, some have a red spot on each forewing, and yet others have a pair of red spots on each wing. 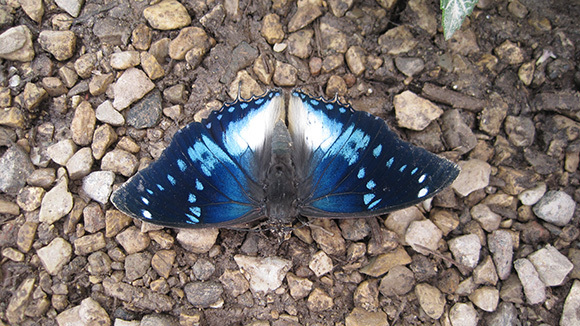 Puddling—Puddling is the tendency of butterflies to sit in wet soil or stone and extract the minerals from the ground. Apparently, puddling is somewhat exclusive to male butterflies, because they need these minerals for sperm production. This is also why the butterflies (especially males) land on visitors. They drink our sweat to obtain these precious salts, sometimes absorbing them directly through a t-shirt! 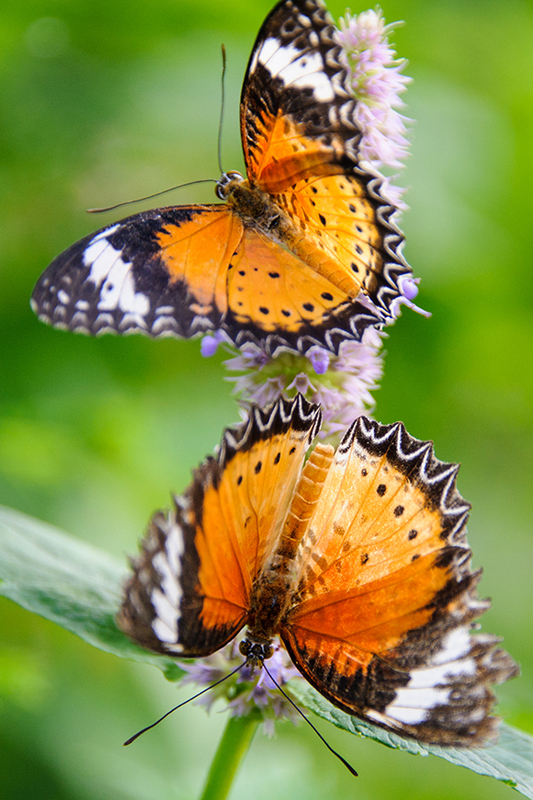 Sexual Dimorphism—Butterflies tend to have different color and sizes based on whether they are male or female. This phenomenon is known as sexual dimorphism. Because female butterflies lay eggs, they tend to be a bit larger than the males. The males tend to have richer coloration and/or bolder patterns. Just like birds and fish, females will tend to choose the males with the boldest colors, as this indicates healthy genes. These are just a handful of terms I like to use when talking about our amazing collection of butterflies. Expect to be quizzed on them during your next visit to Butterflies & Blooms!